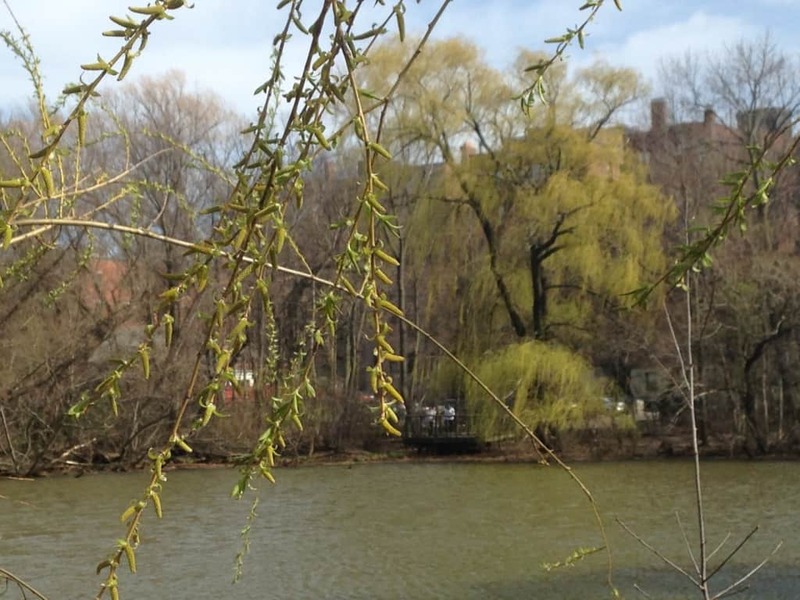 Willow in Spring at Hall’s Pond. Don’t let the diagrams scare you! Don’t let the long names drive you away. Phytochemistry can be intimidating at a first look, but it does have some useful insights to offer even the most folksy of healers. The best parts of it are those that bear directly on your practical experience working with herbs. Let’s take an investigation into the salicylates, famously found in willow (Salix alba), as an example. Salicylic acid is a type of polyphenol known as a phenolic acid. These taxonomic categories can sometimes indicate the activity of their member constituents; all the phenolic acids, for example, are antioxidant and antiinflammatory – or said another way, they are cooling in nature. Salicylates are various forms of salicylic acid which occur in plants. They are immediately identifiable by taste: they lend elements of astringency, bitterness, and “coolness” to an herb’s flavor. This highlights the importance of organoleptics – the ability to make sensory assessments of your herb/preparation’s qualities and potencies. If you know the taste of salicylates, you can assess for yourself whether a given tincture was made appropriately to extract them in physiologically relevant amounts. When researching an herbal constituent, I always like to find out what its role is in the plants in which it is found. Salicylic acid, it turns out, acts as a plant hormone & pheromone – that is, as a signaling molecule, both within the plant’s tissues as well as between plants. 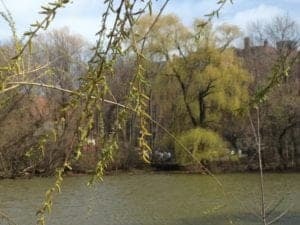 When one leaf of a willow tree is attacked by an infection, for instance, it will release salicylic acid as a signal to other leaves that they should protect themselves. They release defensive antimicrobial compounds in response. Some plants (e.g. wintergreen, Gaultheria procumbens), produce a compound called methyl salicylate, in which the salicylic acid molecule is joined to a molecule of methanol. This compound is volatile – that is, it evaporates and travels through the air – and lends the distinctive “wintergreen” scent to that plant as well as birch (Betula lenta) and meadowsweet (Filipendula ulmaria). These plants release it when they’re fed on by insects, and it serves both to warn neighboring plants that an infestation may be on its way, as well as recruiting beneficial insects to come in and kill off the ones eating the leaf! Willow, though, produces only small amounts of methyl salicylate. It carries more of its salicylic acid in the form of salicin, a glycoside – that is, a molecule bound to a sugar (glucose, in this case). This form is also often found in poplar (Populus spp.) bark. Just as the forms and concentrations of salicylates found in plant can be quite different from species to species – and this variability has implications for how we make our medicines and formulations – we also observe clinical variability in individual response to these medicines. Willow and other salicylate-bearing herbs work great for some people with some types of headaches, but not so well for others. Those with a hot constitution or a fiery presentation accompanying their headache – red cheeks, flushed face, subjective feelings of heat – will respond best to the cooling, draining effects of willow and its salicin. This reminds us that we can never leave these energetic considerations out when choosing a remedy, even if we have good phytochemical reasons for thinking it may be useful. Salicylic acid may also be familiar to you from its occurrence in aspirin, a synthetic derivative properly called acetylsalicylic acid. As a drug, this compound exerts antipyretic (fever-reducing) and antiplatelet/antithrombotic effects (preventing blood clotting), in addition to its broad antiinflammatory action. After ingestion, salicin is metabolized to salicyl alcohol, then to salicylic acid. As it moves through this metabolic breakdown process, salicin acts as a nonselective COX inhibitor: serving as an antiinflammatory, as aspirin does, by blocking of the release of prostaglandins (hormone-like mediators of the inflammatory response). This conversion isn’t completed until the constituents pass through the intestines and liver, which, on the one hand, means that willow usually isn’t as fast-acting a painkiller as aspirin can be. On the other hand, this delayed conversion is a good thing for your GI tract! It is the exposure to free salicylic acid released during the relatively rapid metabolism of aspirin which leads to its notorious gut-irritating and ulcer-forming effects. For this reason, willow bark and meadowsweet will never cause potentially life-threatening bleeding ulcers the way aspirin can. Ultimately, salicylic acid will be excreted in the urine, which makes willow and other salicylate-containing plants very useful for urinary tract inflammations, though this is rarely noted in the herbal literature. Understanding pharmacokinetic considerations such as this – how the chemical moves through the body, how it’s metabolized, how it’s excreted, and so on – can frequently give us insight into applications for a plant which we might otherwise miss. Willow is more famed as a remedy for headache, fever, and rheumatic pains. The German Commission E, a very conservative authority, writes in its monograph that willow bark is effective for those purposes at doses of six to twelve grams of powder. How does that compare to taking an aspirin tablet? Salicylates occur in relatively minute amounts in plants when compared to pills; willow is approximately 1% salicin. If you do the math on this, you’ll find that the total salicylate content in any reasonable dose of willow bark is substantially less than the acetylsalicylic acid content of a single aspirin tablet, especially after we account for metabolic inefficiency – only about a third of the salicin ingested is effectively converted to salicylic acid in the body. For example, that six gram dose recommended by the Commission E would cash out to about 60 mg of salicin, of which 20 mg may be expected to become active salicylic acid in the body – compare that to the “usual adult dose” for pain and fever, 325 to 650 mg of aspirin! Yet in practice, we find standard effective doses of willow tincture are in the range of one to eight milliliters of 1:4 strength tincture, which would be the equivalent of only ¼ gram to two grams of the bark powder, and 2.5 to 20 mg of salicin. All of which means . . . it’s more than the just the salicylates at work! This brings us to a very important point to consider when looking at herbal constituents: synergy! In herbal medicine, the soul is always greater than the hum of its parts. (That’s how that saying goes, right?) In almost all cases, plant constituents work more effectively in their naturally occurring mixtures than they do when isolated or synthesized. There are many cases of inferior efficacy or unwanted side effects emerging when individual constituents are isolated and taken in extraordinary doses, which would never occur when working directly with plant matter and simple extracts. So salicylic acid may not be accountable for the entirety of willow’s action, but still, we observe that salicylates occur in plants who all have similar actions – cooling, draining, astringent. That’s a reflection of the fact that the organic machinery(?) artistry(!) required to produce this constituent is likely to also produce others of a similar nature. These are all polyphenols > flavonoids of various types, and all share effects we could categorize energetically as cooling and/or drying. This in turn speaks to environmental influences on the energetics & actions of our plants: willow trees live in wet areas and need to be able to handle a lot of water around their roots; tannins and salicylates seem to help them do so. It also points towards a constituents/energetics axis – the idea that certain constituents lend predictable energetic qualities to the herbs in which they’re found. Meadowsweet (Filipendula ulmaria), by Peter O’Connor. Finally, that high tannin content also has consequences when it comes to medicine-making: willow bark may cause precipitation when mixed with alkaloid-rich or mucilaginous herbs in a tincture formula. 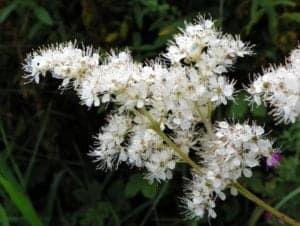 If you want to include a salicylate-rich herb in such a blend, you might be better off choosing meadowsweet, which has lesser tannin content. So, who’s afraid of phytochemistry? For everything from honing our senses, recognizing variability, appreciating synergy, providing clues to underutilized therapeutic applications, and aiding in medicine-making and formulation decisions, it turns out that phytochemistry can actually be pretty useful! We’ll have more to say on this topic. Stay tuned! This is great! Can’t wait for the next one! I’ve been meaning to investigate meadowsweet next month. Thank you for the post and I enjoy all your posts because they are sensible and rational. Could you please tell me why precipitation is bad? Will it affect the quality and efficacy of the formula if left alone? Can I just shake the bottle and mix it right back up? Thanks. What if you make a tincture with both willow and meadowsweet? Precipitation is generally assumed to mean diminished availability of the bound constituents. Lisa Ganora has challenged this assumption in her text Herbal Constituents, though, and I respect her take on this. It may not be a hard limit on the effectiveness of the preparation. So yes – if it precipitates, shake it up before use, and you may still be getting everything you hope for. It is just not certain as of yet. Sure, why not? I often like to make “friends” blends – herbs that all share a particular quality or constituent. That often gets you a complex of activities that’s broader than the single herbs alone.